It provides software solutions for every organization in your company – from marketing to sales to engineering – that will help you, in your value creation process, to create differentiating customer experiences. With a single, easy-to-use interface, it powers Industry Solution Experiences – based on 3D design, analysis, simulation, and intelligence software in a collaborative, interactive environment. It is available on premise and on cloud. The 3DEXPERIENCE Portfolio On Cloud expands capabilities already available on the V6 architecture and unifies the user experience for all Roles and Industries. Offered as Software-as-a-Service (SaaS) on cloud provide increased flexibility and fast deployment, all services and support of the cloud provider are included in the price, with Dassault Systèmes as the single point of contact and provision. The cloud operates 24 hours per day, 7 days per week, 365 days per year, and includes maintenance, licensing, and upgrades. Total Cost of Ownership is improved by reducing requirements for computing and storage, as well as facility and human resources costs, empowering enterprises of all sizes, and enabling rapid sizing and capability deployment. 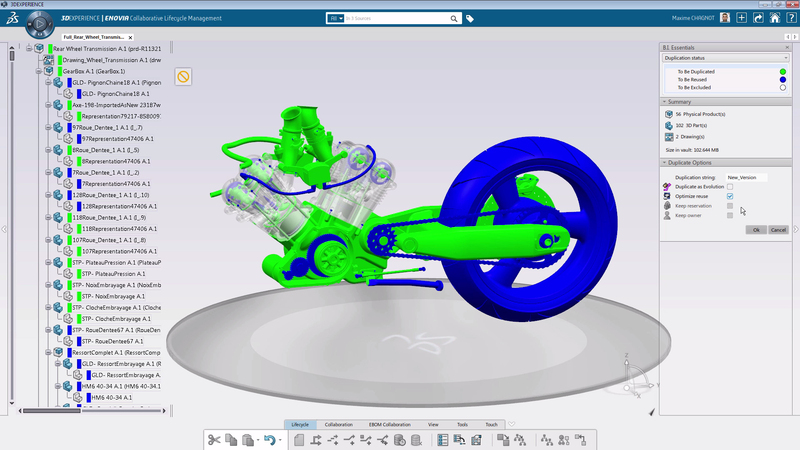 An intuitive single, compass-like interface provides easy-to-use navigation, search, and collaboration in the 3DEXPERIENCE platform environment, making it inclusive for all disciplines in the company – engineering, manufacturing, simulation, sales, marketing, finance, procurement, and management. Initial purchase of on cloud service includes 25 GB storage space. Successfully delivering a compelling experience to customers that requires collaboration between a company’s employees, customers and suppliers. ENOVIA provides a secure and real-time environment for all users to find, shear, review, and report on product information. Collaboration can be loosely managed or more tightly controlled with cross-functional change processes depending on the company’s needs. CATIA Engineering provides the platform which enables engineers to cerate any type of 3D assembly, for a wide range of engineering processes. Simulation is a driver of innovation at many companies today and is no longer simply an engineering activity used after-the-fact to fix problems. From solve to innovate, the Multiphysics Modelling & Simulation portfolio provides complete access to the state-of-the-art power of Abaqus for analysts within the 3DEXPERIENCE platform environment allowing not only solving, but also knowledge capture, tool integration, design space exploration, best-practice development, method re-use, and collaboration. The portfolio maximizes the value of a customer’s investment in simulation horsepower by allowing simulation results and IP to become a true corporate asset that powers innovation. Fluid Mechanical Analyst, validate engineering requirements of complex products using advanced Computational Fluid Dynamics (CFD). Multiscale Systems Analyst. Best in-class user experience with easy drag-and-drop options. Noise & Vibration Analyst. A Simulation role for the Analyst that uses advanced linear static and dynamic simulation techniques to validate the engineering requirements. Finite Element Modelling and Assembly Specialist. A Simulation Role for Analysts who specialize in the creation and/or management of large and complex finite element assemblies requiring automated mesh generation. Structural Vibration Analyst. Advanced linear static and dynamic simulation. Assembly Modeling Specialist. Create large and complex element assemblies. Mechanical Analyst. Advanced finite element simulation techniques to understand and validate complex engineering problems. Simulation Result Analyst. Advanced finite element simulation techniques to understand and validate complex engineering problems. Enabler for Nastran is an optional platform option that provides NASTRAN import, export, and results for roles such as SMU, SFM and SMR. DELMIA Digital Manufacturing solutions drive manufacturing innovation and efficiency by digitally planning, simulation and modeling global production processes. DELMIA allows manufactures to virtually experience their entire factory production from the impact of design to determining how to meet global demand. These simulation activities allow manufacturers to better address and shift processes so as to quickly respond to the competition, or to take advantage of new market opportunities. 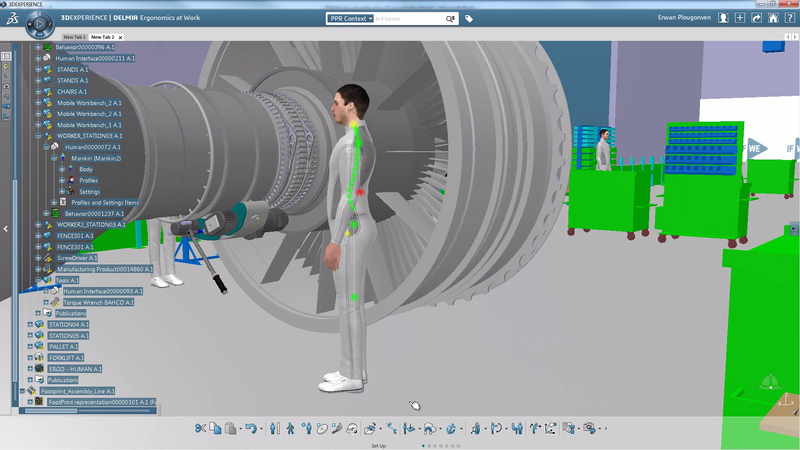 Visit Dassault Systèmes’ 3DEXPERIENCE page to learn more about the solution. Access customer stories, videos, communities and events.